There have been 1,000 mass shootings in America over the last 3.5 years. That's almost good for a rate of one per day, though we only see the highlights make national news, like when 49 were killed in Orlando (another 53 injured) in the deadliest mass shooting in the country's history. The response to such massacres by those in power -- those with the power to, perhaps, try and decrease this rate of mass shootings -- is swift and consistent, whether the victims are over 100 patrons of an LGBT-safe club in Orlando or 20 children in a Connecticut elementary school: thoughts & prayers. That's because, to quote an Onion piece that feels like it'll be forever relevant, there's 'No Way To Prevent This,' Says Only Nation Where This Regularly Happens. 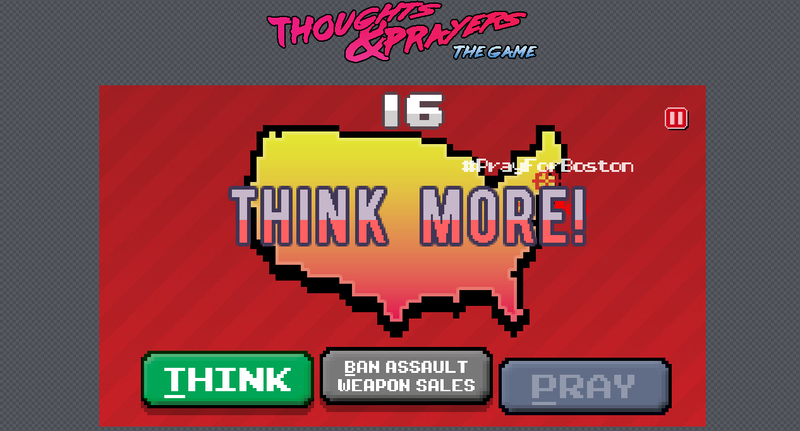 Thoughts & Prayers: The Game is a free browser game that lets you try and save lives by alternating between thinking about and praying for victims of mass shootings in America. So far my high score is 142 thoughts & prayers (I'm still dealing with this dislocated thumb), which saved a combined 0 lives, but I bet if you pray and think harder than me, you might save a few. One tip I can offer: ignore the "ban assault weapons sales" button that shows up halfway through the round. There's no keyboard shortcut that I can find (thoughts are mapped to T, prayers to P) so it means pulling out the mouse to click and: 1) that's way slower, eating into your thoughts and prayers total and 2) so far I can't get it to do anything.